Edmund Samarakkody lawyer, politician and trade union leader passed away on January 4, 1992, leaving behind him, as great men do, footprints on the sands of time spanning over six decades. 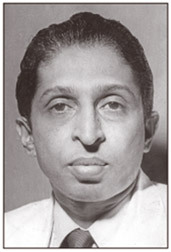 Samarakkody practiced his profession as a member of the Mount Lavinia Bar for over four decades and it was during this length of time that this writer had the pleasure and privilege of being closely associated with him in many a legal battle in Court concerning public interest or the liberty of the subject that enabled him to closely follow his career as a politician. Most certainly it can be said without fear of contradiction that Edmund’s labour and achievements in the socio-political arena of Sri Lanka during such a length of time is commendable and worthy of remembrance. It is a task well nigh impossible for one to recount in a short discourse all his life’s work and attainments: It certainly is the task for a historian or biographer. Edmund was a man of indomitable courage, impeccable character, of high principles and great honour and one who always acted with determination and sincerity of purpose. These qualities of Edmund were manifestly reflected and demonstrated in his life’s work as a lawyer, politician or trade unionist. It can be truly said of Edmund that he undoubtedly belonged to that class of men who are fast fading away who engage themselves in politics with altruistic motives, seeking the ideal in consonance with their political beliefs in an endeavour to change the ideal into reality. Edmund also firmly believed in the ethical principle that in order to build yourself you should not destroy your adversary whether it is in politics or any other sphere of human activity. Regretfully current trends in the country manifest the contrary. With the escalation of political violence, mayhem and murder particularly during political elections in recent times, politicians today talk of building a new political culture with the objective of de-escalating if not totally eliminating political violence. It cannot be truthfully said that political violence did not exist during the days of Edmund’s political contests. May be, it was of a lesser degree and not that grave with the entry of suicide bombers, pistol gangs and use of sophisticated weapons like the hand grenade or T56 in more recent times. During the early days newspapers reported the use of knives, home made bombs and sand filled bottles or stones. In fact Edmund himself has been the victim of political violence: As a member of the Lanka Sama Samaja Party he entered the main stream of national politics in 1947 to contest D S Senanayake for the Mirigama seat in Parliament. And after that election that he lost Edmund managed to return home sans injury but not without his bug Fiat being smashed by a boulder flung at his car. It was common knowledge that during the same election in the Kelaniya electorate Dr N M Perera and other LSSP leaders had to go in search, with Police assistance, for Party Polling Agents who had taken refuge under culverts through fear of harm. Edmund was again the victim of political thugs when he took the difficult path on the language issue and also openly stood up for the rights of the Tamil people being faithful to his belief in internationalism as against chauvinistic nationalism. Edmund Samarakkody’s as a youth had been inspired and influenced by the philosophy and ideology of Marxism and enthusiastically participated in the radical activities of the newly formed youth leagues in the early thirties. Edmund himself had joined the South Colombo Youth League. The activities of these youth leagues were further strengthened by Edmund interacting with a group of young intellectuals holding similar views, who had returned to the island having completed their studies abroad and participated actively in the anti imperialist political struggle of the day. The Lanka Sama Samaja Party was officially formed on December 17, 1935 during the time of the Donoughmore Constitution, with the main objectives of continuing the political struggle for independence from British rule and the establishment of a socialist State. Among the founder members were Dr N M Perera, Dr Colvin R De Silva and Philip Gunawardena who held office as the General Secretary of the party. Edmund was elected to serve on the Executive Committee. The LSSP began work on a low key and participated in the ‘Suriya mal’ campaign an anti British activity of that time and also activated the trade union movement in Colombo. In 1939, the LSSP accelerated the pace of trade union activities in the plantation areas: With the police shooting dead Govindan a plantation worker at Mool Oya the LSSP began a series of strikes and also began public agitation against British rule and this led to the LSSP being proscribed by the British Raj during the world war in 1940.